The weather put quite a lot of people off fishing this weekend, which is a bit of a shame, as there was some nice fish landed. Plenty of Gurnard and a few nice Bream, were landed towards Portland. I fished at Ferrybridge on Saturday and as soon as the first spots of rain hit, the beach cleared. I would love to say that I was nice and dry in my waterproofs, but I would be lying. I recently boat a set of lightweight Shakespeare waterproofs to keep me dry during a summer shower, instead of wearing my heavier weight ones I use the rest of the year. What a waste of money! They leaked from every seem and I even tore them trying to put them on with my boots still on. I will be back out again today in much windier conditions in the pursuit of some nice Chesil Bass. Conditions are almost perfect, with some nice surf churning up the shoreline and releasing lots of food into the water. Use fresh Peeler Crab, a whole squid or a Mackerel head, for your best chance of a big Bass. Take care though, because a rouge wave could easily sweep you out to sea. You don’t have to cast far, so keep well away from the waters edge. If you want some where a bit more sheltered to take the kids today, then try one of the piers in Weymouth. I prefer the Stone Pier, as I think the variety of species there is better. You can catch Bream, Pout, Pollock, Wrasse and Flounder from there. If you float fish a small strip of Mackerel you can normally catch plenty of Mackerel and Garfish. Chesil Beach: Rough with 2m waves. The water is still pretty clear for the moment. Portland: 2m waves on the West side, but the East side is a lot calmer. Water clarity is still good. Chesil Beach forecast: With casting distances going to be effected by 22mph plus winds, and a rough sea, most people will stay clear of the beach, unless they are targeting Bass. It will be possible to catch some Mackerel, but there are easier marks to fish for them today. Having said that, these conditions often tempt large Undulate Rays to come close to shore from West Bexington and Cogden. Portland Harbour: Fishing in the harbour has picked up with some nice Flounder and Bass coming out, from both shore and the boats. 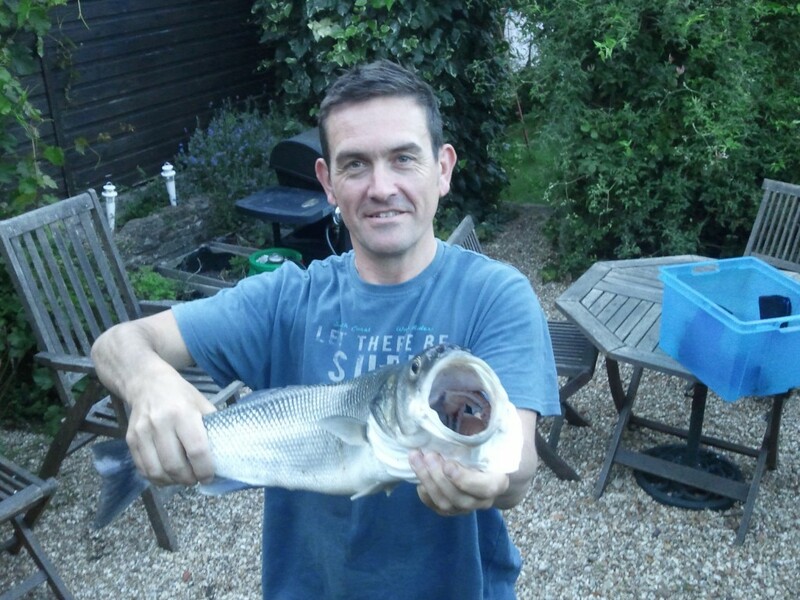 Brian Charlton managed this fine 5 1/2lb Bass from Sandsfoot sailing club area from his Kayak. Poole Harbour: Poole harbour seems to be fishing really well at the moment. 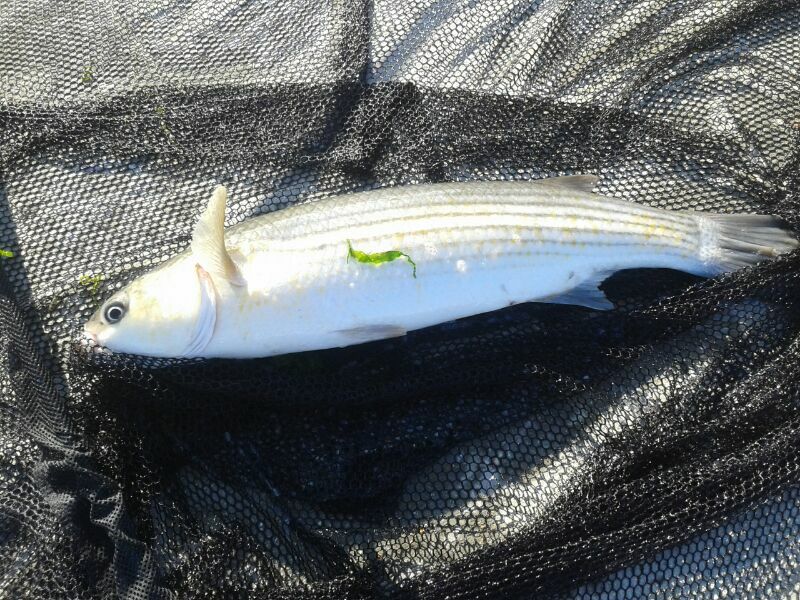 Our Poole regular, Leo and his mate Martin have been catching some lovely Mullet around the new bridge. He had a weeks holiday and managed to get out on his boat, where he caught plenty of Plaice from near the entrance. The harbour is full of Bass, but most of them are small schoolies. Please make sure that all Bass under 36cm are returned, in reality it would be good to see all Bass under 44cm returned, but I know a lot of people are unwilling to do that.